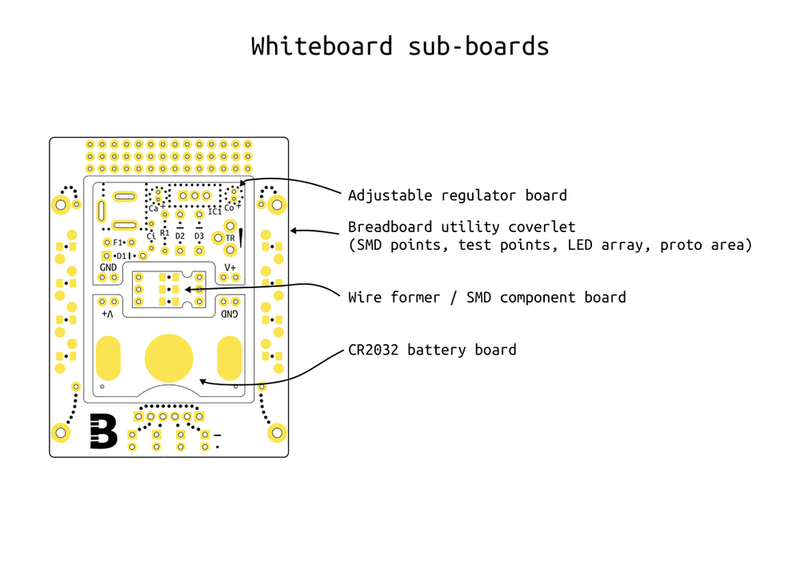 Whiteboard is a set of circuits designed to allow you to power small circuit ideas on 170-point breadboards. It consists of four parts, a 3V coin cell plug-in module, a linear variable power supply, a plug-in SMD adaptor and a supporting coverlet. All these arrive in a little white canvas bag for storage. Whiteboard was project #22 of the Boldport Club. The circuit board consists of a surrounding board with a number of different smaller boards panelised together. The main two parts are the 'battery board' and the 'adjustable board', they fit into the top or bottom of the breadboard and can be interchanged. Note: Use a tool to separate the panel into the individual boards (after or before assembly of components). Carefully and gently slightly move and twist the pieces around the fasteners (the bits that hold the individual boards together) until they separate. Continue doing so until the boards seperate completely. Use a small pliers or a cutter to remove the pieces that remain attached and smooth the area of the fastener that's left on the board. The CR2032 battery board will supply a convenient 3V supply for prototyping small portable ideas. Whereas the adjustable regulator board supplies a variable supply of 1.25V to 10V from a 12V DC power supply through the 2.1mm barrel jack socket ― make sure the polarity of your supply matches the one indicated on the other side of the jack! You can use power supplies below 12V but keep in mind the highest output voltage you can achieve will be 1.5V to 2V below the supply voltage. We designed it so that it cannot overheat too much with the use of a 100mA polyfuse. At close to 200mA the fuse will limit the current by increasing its resistance until the current reduces again. If you'd like higher output current ― you should definitely add a heatsink on the LM317 in this case ― there is a solder jumper underneath that will allow you to bypass the fuse. The small board in the middle is a wire former / SMD component board. It has footprints for 0805, 1206 and SOT-23 components leading to headers. This is useful for using those small components with the breadboard. It also has small notches so you can bend through-hole components' wires at 7.62mm. Finally, the surrounding breadboard utility coverlet is a board designed to be placed around the breadboard. It has a number of areas available for prototyping. The coverlet connects to the breadboard using four test points close to the inner edge. To attach the breadboard to the coverlet, use the leftover 1N4001 diode leads and bend them to shape using the wire former. Then solder one end to the coverlet hole and insert the other end to the breadboard. There coverlet has a place for four white LEDs and a header so that you can test signals using them. The LEDs have no current limiting resistors so must be connected from the breadboard using resistors. The LEDs are connected with a common cathode arrangement. See the LED's datasheet for specs. You can either solder in the components and then break out the boards, or break out the boards before soldering. Keep in mind the smaller boards may be a bit hard to solder broken out as they are quite small.